Right before the end of the year 2009 Slovenian Champions Gorenje Velenje separated with three players and their head coach Ivica Obrvan. At the end of year 2009 Slovenian Champions Gorenje Velenje canceled the contract with three players and with head coach Ivica Obrvan. For the rest of the season the team will be led by Obrvan's assistant Branko Tamše. It was all due to financial problems. A new policy in Gorenje Velenje forced the club's management to change the strategy and to cut down costs. In accordance contract discussions were held with almost all players of the squad. As most of them agreed on new conditions, three players chose to leave the club. Boštjan Kavaš left for Metalurg Skopje, Matjaž Mlakar transfers to Cimos Koper and Sebastjan Sovič is considering ending his career. 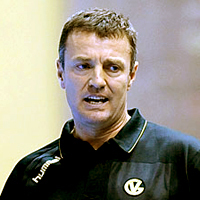 After unsuccessful negotiations also head coach Ivica Obrvan left the club. On Monday Gorenje Velenje started their preparations for the rest of the season with the new head coach Branko Tamše.